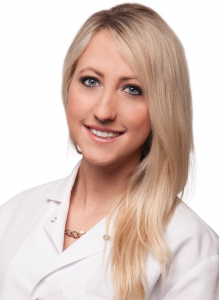 Breanna L. (Moe) Kruckeberg, D.M.D. My life has truly come full circle by joining the team at Waseca Dental Care. I was born in Waseca and grew up on my family’s farm just north of New Richland. After graduating from NRHEG High School and starting college at Mankato State, I traded snowstorms for sunshine and finished my undergraduate education at Arizona State University in Tempe, Arizona. I then moved to Fort Lauderdale, Florida for dental school at Nova Southeastern University. Following dental school, I practiced in Arizona for two years before reconnecting with my future husband, also an NRHEG graduate, who finally brought me back home to Minnesota. We recently moved near Rochester, as he is completing his Orthopedic Surgery residency at the Mayo Clinic. We could not be happier to be back home and be a part of the community that helped raise us. Outside of the dental office, I enjoy spending time with family and friends boating, golfing, traveling and cooking. I’ve been fortunate to have met so many incredible people in the Waseca area thus far and I can’t wait to establish new relationships in the near future! Not just anybody can claim to be a country girl and a city girl, but I can and do. I started out my life on a very small dairy farm in southeastern Minnesota and am happy to say I developed my work ethic there. Around my eleventh birthday I moved to Minneapolis where I found a whole new world. I am truly grateful for the diversity in my upbringing. I finished high school in Minneapolis and returned to my rural background when choosing college. I graduated from St. Olaf College with a Bachelor of Arts in Psychology and went on to the University of Minnesota School of Dentistry. I graduated in 2000 and joined a group practice in Champlin Minnesota. I returned to the School of Dentistry to teach part time for a short time while maintaining my busy work schedule, but soon discovered I loved being a dentist much more than being a teacher. Dr. Craig Peterson lured me to Waseca in 2002 and I am happy to call it my home. I took over his practice in 2003 and have been able to keep the wonderful staff and family-like atmosphere he worked so hard to achieve intact. I live in Waseca with my two little girls, and truly enjoy being a part of such a warm community. I have met so many wonderful people here and look forward to meeting you too.